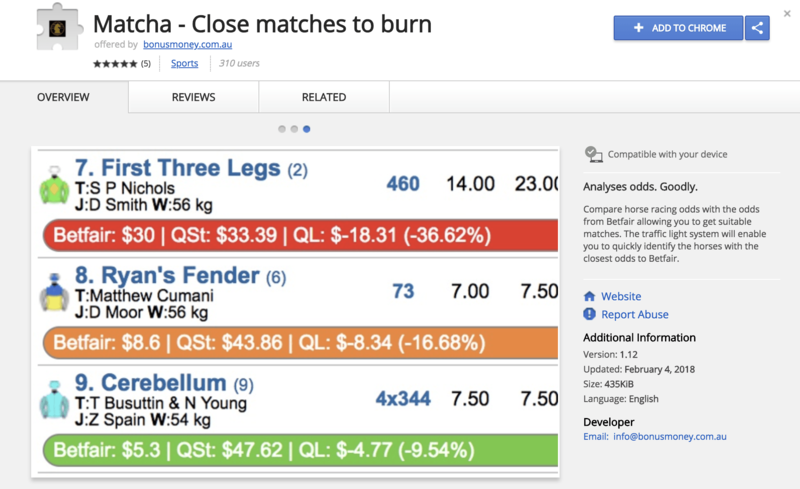 The Matcha is an original, market leading Chrome extension made by Bonus Money that makes it much easier to find suitable bets to profit from horse racing promotions by allowing you to quickly and easily compare odds between a bookmaker and Betfair. Bookmakers use promotions as a way to create loyalty from customers and to entice people to continue to deposit and bet with them. Utilising all the horse racing promotions on offer each week can enable you to make in excess of $1000 profit per month matched betting. This 3 part guide will take you through how to install the matcha, understand the displayed information, settings and features. Teach you how to use the matcha to gain bonus bets, and teach you how to convert bonus bets for more profit. Read below to understand how to install the Matcha for the Chrome Browser. The Guide will also explain all the features and information displayed by the Matcha and will take you through all the settings you can change. Our second guide walks you through an example of how to gain bonus bets and cash back by matched betting horse racing promotions. Our third guide walks you through an example of how to gain a high guaranteed return from any bonus bets you've acquired either from horse or other promotions. When you open a bookmakers horse racing page through Matcha an extra display line will appear underneath the horse information. Matcha displays the amount you need to stake on Betfair to get an equal return regardless of whether the horse wins or loses. If you click the coloured information of the horse that you are betting on then the correct lay stake will be copied in to your computer's clipboard. So when you go to Lay the horse at Betfair you simply need to press ctrl+v (command +v when on a Mac) when entering your lay stake. In Matcha you can choose to display all events currently in the Matcha or to only show events and bookmakers that have promotions on in that event. Matcha comes preloaded with 3 preconfigured profiles. Depending on which profile you choose the information on the bookmaker page displayed will be different. 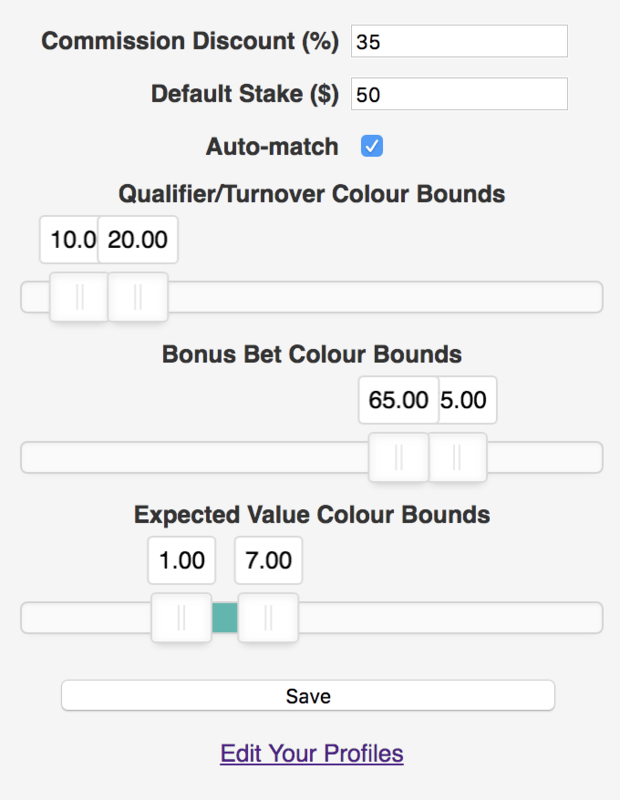 This is the default setting for a bookmaker when the race has a promotion available and we are able to calculate the Expected Value (currently for races with 2nd/3rd promotions). This is the default setting for a bookmaker when the race has a promotion but we are unable to calculate the Expected Value. This setting can be used to find close matches by percentage difference in odds to Betfair. This is useful if we are unable to display the EV to find a close match to qualify for a bonus. It is also useful to find matches to complete any turnover requirements you have at a bookie. This is the default setting for a bookmaker when the race has no promotion linked with it. You can use this setting to highlight and calculate a good return from any bonus bets that you have. To change the settings click on Matcha and then click on the cog. Default Stake - the amount you need to bet. Auto match - whether the extension automatically displays if the corresponding Betfair page is open. Set the traffic light system display boundaries. This allows you to set the trigger points for the colour change in the Matcha display. Edit your profiles - Here you can either amend or create an entire new row of information to be displayed on the bookmakers page. This is only recommended for advanced users. To enable you to quickly identify the best matches the following traffic light system is preconfigured for you. You are able to set the boundaries how you desire in the settings. Matcha covers all Australian thoroughbred racing and some UK racing. You can choose to show all events or just events with bonuses. The dates and start time of races are shown. The number of runners. Betfair base commission percentage and the amount of commission you pay dependent on what you have set in the settings as your Betfair commission discount. Simply click on a race and it will open up more information regarding the race. Matcha will show you which bookies are compatible with Matcha for that race. 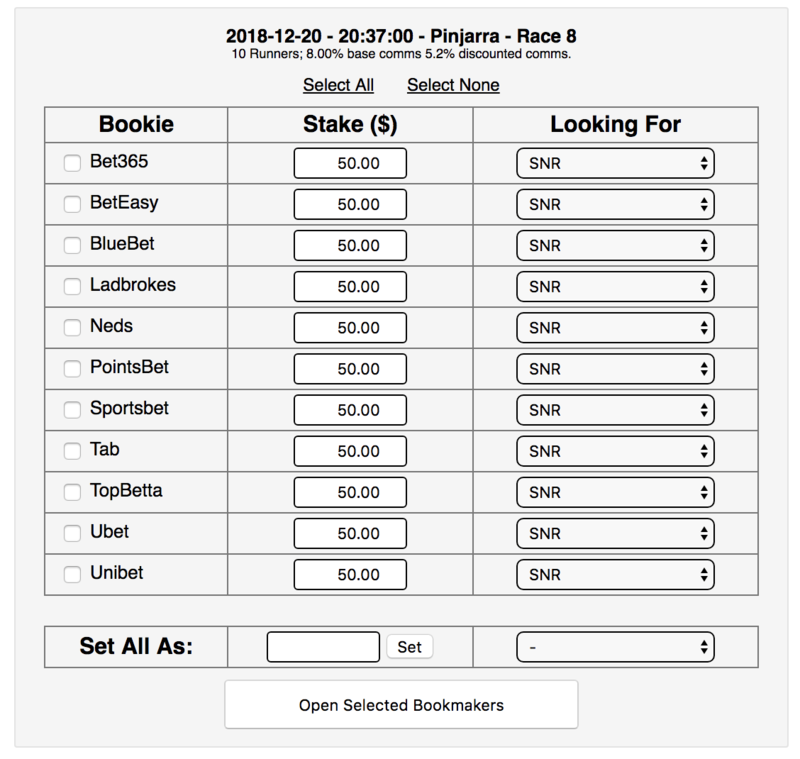 You can choose to select all the bookies or individually select the ones you need. The stake amount can be changed for each bookie. You can also change to look either for SNR (turning over bonuses). Qualifier/Turnover bets. Or, when available Qualifier with EV. When you click the button 'Open Selected Bookmakers' both Betfair and any bookmakers you have chosen will open on that horse rae. 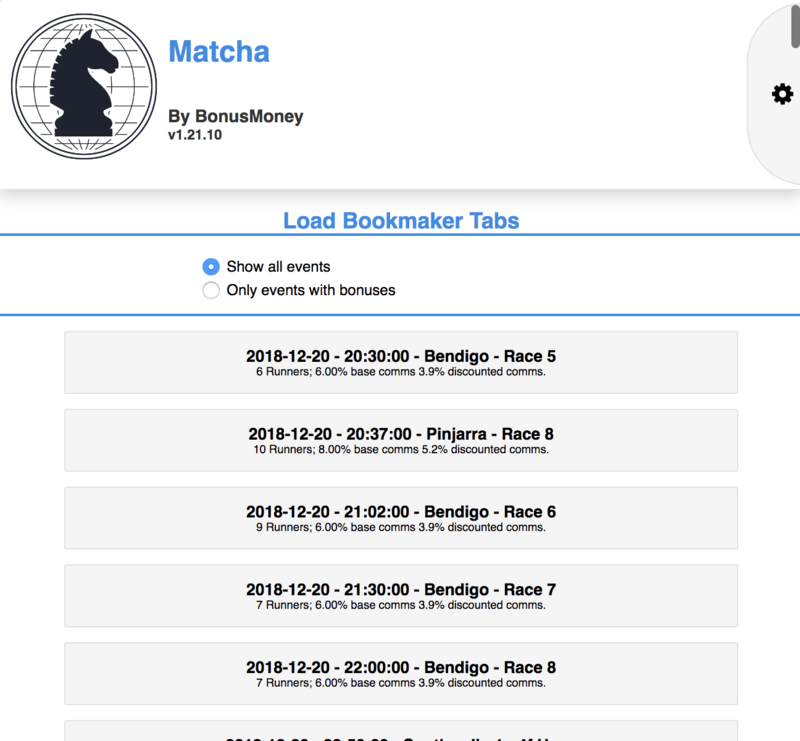 The Matcha information will appear when the Betfair and Bookmaker pages have fully loaded.